2 New Literary Fiction Novels Hit the Shelves! In the year 1907, all of Brampton is present at the sod-turning ceremony for the Carnegie Library. After the event, the crowd rises to walk to the Presbyterian Church… Everyone except Jessie Stephens and her family. Her father will not allow them to enter the Presbyterian Church. No one will tell young Jessie the reason, but she learns that it has something to do with her grandfather. As she seeks to solve that mystery over many years, Jessie slowly begins to learn the history of her family and the town in which she lives. Her tales of everyday life in small town Ontario combine to craft a vivid portrait of a family that is, upon closer inspection, anything but ordinary. Lynne Golding grew up in Brampton, ON, where she lives today. She obtained a BA in History and Political Science before studying law. She is now a senior partner at an international law firm, married with children to Tony Clement, and the winner of the Ontario Book Publishers Organization’s What’s Your Story? short prose and poetry competition. Welcome to Primrose Street, where neighbours share close interactions but know very little of each other. Only the maple trees that have lined the road for decades know their decisions, indiscretions, secrets, joys, and pains. From fifty-year residents Charlie and Cora and their grandson Ronald, to newcomer Sofia and her son Nicolas, to best friends Tabitha and Dayna, the residents of Primrose Street go about their daily lives, all the while remaining invisible to one another. Only when an invitation arrives in their mailboxes must the residents of Primrose Street decide whether to allow authenticity into their lives and neighbourhood or remain limited in their relationships and thereby to themselves. 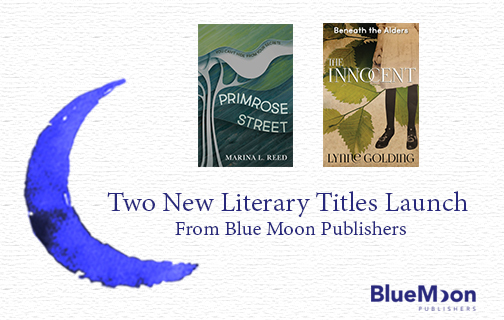 Which new Blue Moon Publishers literary fiction release will you read first?